A child’s physical growth can be easy to take for granted. We say they are “growing up” as the years go by. And yet globally, one in four children under the age of five fails to meet their genetic potential for healthy growth. Stunting, defined as low height-for-age in the critical first 1,000 days of life, is caused by persistent, cumulative inadequate dietary intake and poor utilization of nutrients due to infections and illnesses. It has immediate and life-long health and cognitive consequences for both the individuals affected and their communities. However, to the people who need to take action- families and communities- stunting is often invisible because so many children are stunted, and because it is simply normalized as a genetic issue. Even health workers do not give chronic malnutrition the same attention as acute malnutrition, as few routinely measure linear growth, especially in community programs[i]. TMG created the Child Length Mat to address the need for an inexpensive, intuitive tool that helps families and communities identify stunting. Our Child Length Mat employs easy-to-use visual cues to assess if a child is within a normal height-for-age measurement, enabling community workers and families to identify and address potential problems before the impact of inadequate nutrition becomes permanent. 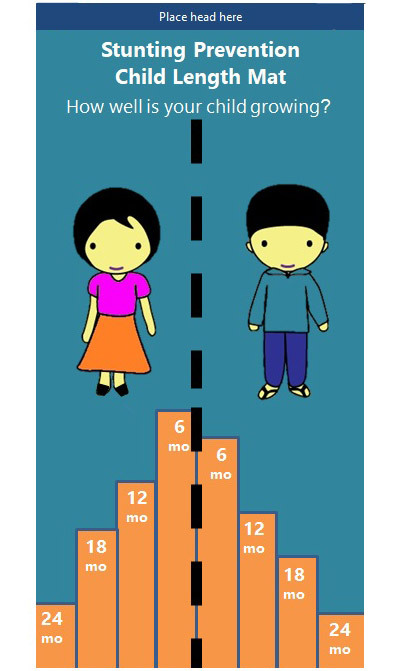 The mat is easy to adapt to different country contexts, both by tailoring the age groups, colors, graphics, and format to reflect the national stunting profile and local preferences. The mat, originally developed for use in Bolivia, has been adapted and employed in Cambodia, Guatemala and Indonesia. In Cambodia, 70 communities in Pursat Province use our Child Length Mat as part of on-going community growth promotion sessions led by the USAID-funded NOURISH Project. Trained community health workers, called Village Health Support Groups (VHSG), weigh every child under two years old every month, and assess a child’s length at 6, 12, 18 and 24 months. A review in July 2017 consulted with 150 mothers and grandmothers of children under two years, 10 VHSG volunteers and 10 health workers. The review found that they could understand and explain the Child Length Mat, and the importance of tracking their children’s linear growth. VHSG volunteers say that the length mat is an easy-to-use visual tool that prompts attention to linear growth, in addition to on-going support on weight gain each month. [i] Kathryn Dewey and Khadija Begum. Why stunting matters: Alive and Thrive Technical Brief. Issue 2, Sept 2010.